Home Blog Happy New Year by Alt-team! Happy New Year by Alt-team! Thank you for visiting our website and thank you for being our clients! Today is the 31st December 2014. It is the last day of the 2014 year and we'd like to make a review of our work in 2014! Cs-Cart "Quick Search" add-on for CS-Cart 4v.It extends the standard CS-Cart search functionality. CS-Cart RollOver Image add-on for CS-Cart 4v. It adds a nice change-image effect to your images and makes your website more dynamic. CS-Cart Vertical Categories Menu Style add-on for CS-Cart 4v. It allows you to create a categories side menu where subcategories are displayed in columns. Cs-Cart Variant Images add-on for CS-Cart 3v and 4v. It allows you to assign several images for each of your option variants. CS-Cart Cache for Anonymous users add-on for Cs-cart 3v and 4v. It makes your website faster. CS-Cart Buy in 1 Click add-on for CS-cart 3v and 4v. It makes the order easier for the customers. CS-Cart Currency IP add-on for CS-Cart 3v and 4v/ It allows changing between the currencies automatically according to the visitor's IP. CS-Cart Reviews Tree add-on for CS-Cart 4v. It makes your customers post more reviews to the products. CS-Cart Banners' text add-on for CS-Cart 4v. It allows adding a title, a text and even a link to the banners. CS-Cart Accordion Menu add-on for CS-Cart 4v. It looks good and convenient for your customers. It allows displaying any categories level. CS-Cart Guest Checkout by Default add-on for CS-Cart 4v. It reduces the checkout page in one step. CS-Cart Loyalty Bonus add-on for Cs-Cart 4v. It is a FREE add-on. It allows you to reward your loyal customers with the discount. Many others Cs-Cart add-ons were released in 2014. Please learn more here. 2. 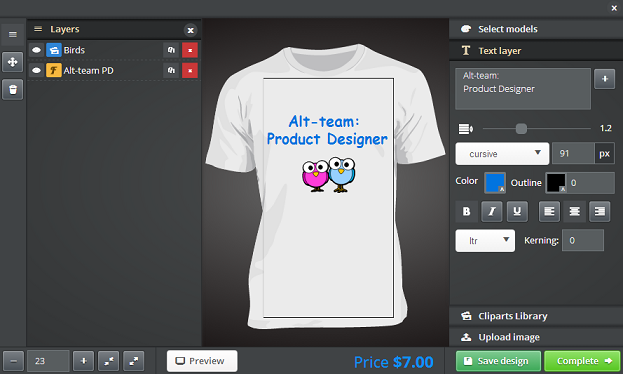 Our big project E-Commerce Product Designer software has been released! E-Commerce Product Designer software has a user-friendly interface and turns the designing process into a convenient and interesting adventure. We are sure that every customer, who are interested in this tool, could find the most appropriate price solution for their business. 3. As you know we are developing add-ons and modifications not only for CS-Cart but for Magento too. This year we have launched the special section for our Magento Customers. Hope that they will find all information about our company and the services that we can offer to them. 4. Our charity program has brought its results and we could make little presents for the orphans. Learn more about this program here. Thank you, our free add-ons buyer. We appreciate your help. In the conclusion, we have got a lot of pleasure working with you this year! We wish you many happy days in 2015 and let your efforts in business bring you a fortune and a satisfaction.